The deltoid muscle covers your shoulder joint from back to front, enabling you to abduct, extend and flex your arm. Straining this muscle can cause significant pain and consequently affect your range of motion and strength. With an injured deltoid muscle, you will likely find it difficult to throw a ball, perform push ups, swim or do any other sport or exercise that required movement of the shoulder. 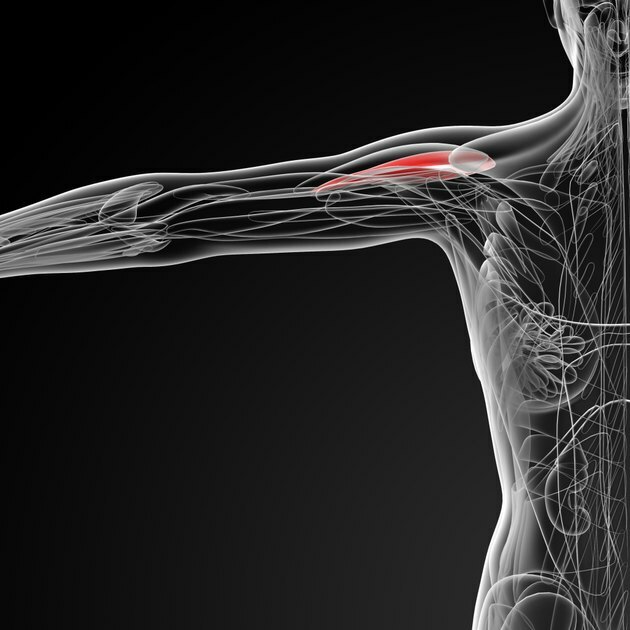 If your deltoid is injured, consult with a doctor for a firm diagnosis. You can then see a physical therapist who can prescribe stretching and strengthening exercises that are a critical part of the rehabilitation process for such an injury. Once you've been cleared, you can continue to work on range of motion and strengthening. Restoring your shoulder joint's range of motion is the first goal of a rehabilitation program for a deltoid strain. Stretch your arms behind your back with your hands together for the anterior, or front, portion of the deltoid, and pull your arm across your chest and neck to stretch the middle and back portions, respectively. Hold each stretch for 10 to 30 seconds, or lengthen the muscle repeatedly for the same amount time to stretch dynamically. Perform isometric exercises to contract your deltoid if moving your arm causes discomfort -- often early in the rehabilitation process. Stand facing a wall, or sideways -- with your injured arm closest to the wall -- or with your back to the wall, depending on the location of the injury, then press your hand into the wall for at least 5 seconds. Replace the isometric exercises with dynamic resistance exercises once moving your injured arm no longer causes pain. Perform the front raise and military press for the anterior deltoid, the lateral raise and upright row for the middle deltoid, and the bent-over row and reverse raise for the posterior deltoid. Have a spotter stand behind you when performing the military press with a barbell or dumbbells to provide assistance if necessary. Performing explosive plyometric exercises may be necessary near the end of your rehabilitation program if you're an athlete. The backward medicine ball toss, for example, targets the anterior deltoid. This exercise involves throwing a medicine ball over your head and behind your body as far as possible. Start performing the range-of-motion and isometric exercises daily after resting for several days following the injury. Once the initial pain has subsided, begin performing dynamic resistance exercises three times per week on nonconsecutive days to restore your strength. Warm up for five to 15 minutes before each exercise session to minimize your risk for reinjury. Consult your doctor if the pain doesn't go away or returns at any time during the rehabilitation process.